Killer Characters: Mulch Ado About Murder Cover Reveal! Mulch Ado About Murder Cover Reveal! Note: Congratulations to Traveler for being our randomly selected winner of Murder Most Fowl! Traveler, please check your email. And thanks to all of you for stopping by - I wish I had a book to give away to each one. Cam Flaherty here, from Edith Maxwell's Local Foods Mysteries. And boy, do I have a a great announcement. She recently showed me the cover for the next book - and I love it! What do you think? It's so fun, with Preston trying to catch a butterfly out in the field. In Mulch Ado About Murder, it's been a hot dry spring in Westbury, Massachusetts, where my farm is. As I wait for much-needed rain, storm clouds of mystery begin to gather. May has been anything but merry for me so far. My parents arrived unexpectedly, and my crops are in danger of withering. But when I find Nicole Kingsbury, the owner of the new hydroponic business, dead in a vat of feeding solution - clutching a set of rosary beads - my boyfriend Detective Pete Pappas has another murder to solve. Rain might be scarce, but there's no shortage of suspects, including Nicole's ex-husband, the Other Man who ruined their marriage, and my own mother! Can you believe it? I hope Pete and I can solve this thing before the killer strikes again. 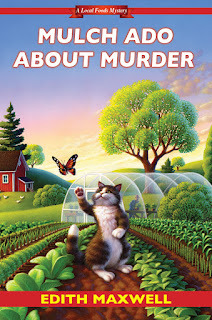 To celebrate the great new cover, Edith says she'll send a signed copy of Murder Most Fowl, book four in the series, to one commenter here. Check in tomorrow to see if you won! And remember, Mulch Ado About Murder is available for preorder wherever books are sold. It releases at the end of May next year! Readers: Do you buy books based on the cover? Edith Maxwell writes the Quaker Midwife Mysteries and the Local Foods Mysteries, the Country Store Mysteries (as Maddie Day), and award-winning, Agatha-nominated short crime fiction. Maxwell is Incoming President of Sisters in Crime New England. She lives north of Boston with her beau and three cats, and blogs here, with the other Wicked Cozy Authors, and with the Midnight Ink Writers. You can find her on Facebook, twitter, Pinterest, and at her web site, edithmaxwell.com. I grew up on a farm, so enjoy a series which has a farm setting. This is a great series...looking forward to reading this next book. dbahn(at)iw(dot)net. 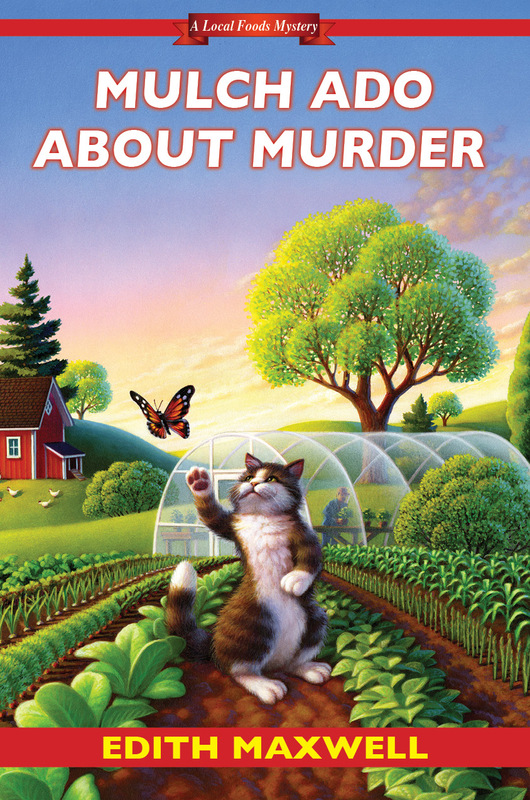 Love both the cover and title for the upcoming Local Foods mystery, Edith! I admit it, a good cover will draw me in every time! I have found great new books that way. The new cover is so cute! Thanks for the giveaway too! A good cover will make me check out a book but Idon't buy based just on that. The cover and or title catches my eye, then I check it out more closely. A cover may grab my attention but I don't purchase a book solely for that reason. Love the coveer---it would certainly make me read the blurb---and probably decide to buy the book. Love the cover! Thanks for the chance at the giveaway. I don't always go with the cover, but it is where I start when looking. I like to read the blurbs to see what the book is about also. An interesting cover absolutely draws me to pick up the book! I've also learned not to rely on that because I've found many series I absolutely adore with very little cover art. I love all the green on Mulch Ado About Murder and the vibrant sunset makes the perfect background. I would be drawn to this cover if I didn't already know it's a great series! Thanks for sharing and selecting a lucky winner! Love Preston playing... it gives a merry nod to the titles inspiration. Can't wait to see what's in store on the farm! I do buy based on the cover and synopsis. Covers (good & not so good) attract my attention, but they're not the reason I'll buy a book. Thanks for the chance. I count on the cover to grab my attention. Then I use the blurb to make the final decision. Covers can certainly get my attention. I must admit to being shallow--a certain type of cover screams "Not my type of story!" and I look at the book no further. Happy to see this new release, really enjoy this series. And all the covers are great. I will pick up a book because of its cover but rely more on the blurb and author to make my decision. Thanks for the giveaway. Love the cover! Can't wait for the next book! I so hate that I was not able to attend Boucheron with Annette De Felice Gavigan & meet you in person. Breast cancer, treatment & recovery have kind of gotten in my way. Your books have filled many hours during my recovery! Annette brought me a signed copy of Delivering the Truth. I can't wait to read it since my great-grandmother was a midwife here in the central Louisiana in the Cane River area! Great cover, great series. I look forward to reading this new one. Yes and no, it's the first page that gets me. Cute covers do attract me (such as Joanne Fluke's Chocolate Chip Cookie Murder) but I like to read an excerpt before ordering or buying a book. Great new cover! I really have to start reading this series. 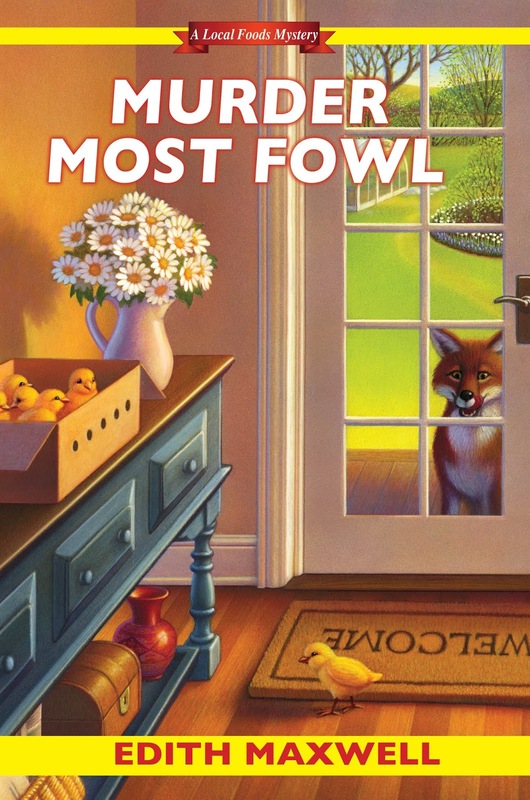 Would love to read "Murder Most Fowl". Good cover illustration does appeal to me. Then I flip the book to read the back cover blurb and skim through some pages. If everything hits home, I buy the book :). Congratulations to Traveler for being our randomly selected winner of Murder Most Fowl! Traveler, please check your email. A book cover definitely helps determine what books I'll read. If a cover looks dark or shows violence, it goes back on the shelf immediately. I don't even bother reading the description. Cute covers tell me that I'm in for a comfortable, sometimes humorous read. In this day and age, that's what I need. An escape from what's happening in the world. Yes, I do buy books based on their covers. I love the great covers on the series I like. That's one of the reasons I have a hard time with ebooks. Yes, this cover does play a big part drawing me to the book. I looks like a dynamite book from a dynamite author.